Wilson NFL leather game model football autographed beautifully in thick silver paint by legendary Hall of Fame Chicago Bears linebacker Mike Singletary. 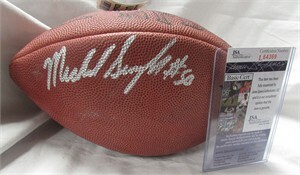 Authenticated by JSA with their matching numbered sticker on the football and certificate of authenticity card. Original bladder was recently replaced so this football will stay fully inflated for many years. ONLY ONE AVAILABLE FOR SALE.